Where: Riverwalk Marina, 3755 US Highway 31 N, Decatur Alabama; just North of Decatur on the HWY 31 bridge headed towards Athens, Al. 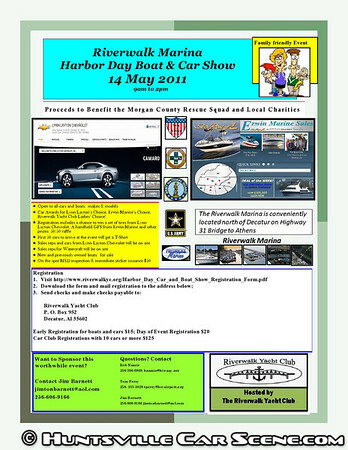 The Riverwalk Yacht Club (http://www.riverwalkyc.org/) is hosting the Harbor Day Boat & Car Show at the Riverwalk Marina 14 May (weather day on 21 May) in Decatur Alabama. 3. Riverwalk Yacht Club Ladies’ Choice! Sponsors for the event include Vets with Vettes, Lynn Layton Chevrolet, Erwin Marine Sale, The Alabama National Guard and US Army. Think your organzations may want to sponsor this worthwhile event? Contact Jim Barnett jimtonbarnett@aol.com 256‐606‐9166. Car Club Registrations with 10 cars or more $125. Proceeds from the events will go to the Morgan County Rescue Squad (http://morgancountyrs.com) and other local Charities. The Morgan County Rescue Squad is a volunteer organization that has served the Morgan County area for the past 50 years. The squad consists of 50 dedicated volunteers that are on call 24 hours a day, 7 days a week to ensure the safety and protection of Morgan County and its citizens. Myself (Jim Barnett) or any Riverwalk Yacht Club (http://www.riverwalkyc.org/) member listed below will be more than happy to discuss the event. All organizations involved are nonprofit. Thank you for the post Jim! How do I add our flyer to the event. Lynn Layton Chevrolet just approved our flyer and his donation. I saw you had posted a flyer in different event. Can you help me with this? Hi Jim. Just email me the flyer and I'll put it up. Cool! Thank you Jim! Looks like it was a great turnout.